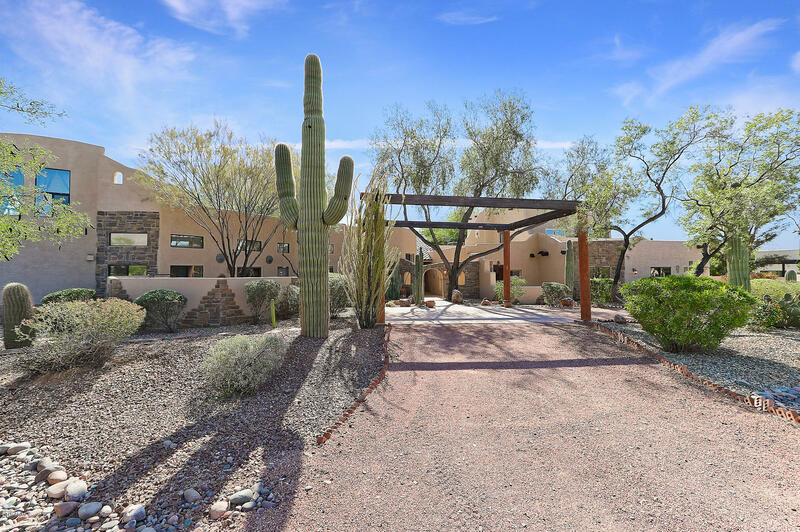 This Executive Estate offers Breathtaking Views of the Superstition Mountains! Over One Acre of Your Very Own Paradise Oasis! Also you looking for a property that can also provide for a home business? Almost 2900 Sq.Ft. Detached Shop is provided plus Separate Garage and also an attached 3 car garage! Check out the Measurements Below! Old World Design Throughout the Property give a Warm and Inviting Feel! Owner's Suite has its own Fireplace, View Room (built to view the Mountain), Private Courtyard, Massive Walk In and Bath with Bidet even a TV in the tub area! Gourmet Kitchen with Huge Pantry, Stainless Appliances, Walk In Wine closet and Breakfast Room Plus Formal Dining. Media Room with Fireplace and Built Ins, Loft leads to two more bedrooms that have walk in closets and a full bath as well as the Balcony that has views as far as one can see. Most of the home is on the main floor, only two beds with the loft and bath are upstairs along with the view room. Expansive Covered Patio has Outside Shower and Fire Feature. Backyard has Separate Outdoor Kitchen Area, Firepit, Several Sitting Areas and a Beautiful Pebble Pool with Huge Waterfall and In Floor Cleaning System. Grass also in the back is completely fenced in separately. Gold Canyon has so much to offer with excellent schools, Quiet Lifestyle, Shopping and Dining Nearby! Energy Efficiency was in mind with Newer Trane Air Conditioners, New Electric Panels and Reflective Roof. See Documents for all updates and upgrades!